MDU Distance Education Admission 2018 – MDU has released notification for admission as well as Re-registration through online to the following Distance Learning Programmes for the session 2018-19. Latest: Supplementary Admission Notice (Distance Learning Programme) 2018-19 has been released. Scroll down to check. The candidates are advised to read the Complete Information of MDU Distance Education Admission 2018 from the official website ‘www.mdudde.net’ or from this page before filling up the Online Admission Form. Candidates will get all the information related to MDU Distance Education Admission 2018 here. Expected Schedule for MDU Distance Education Admission 2018 is given below. For B.A./B.Com. 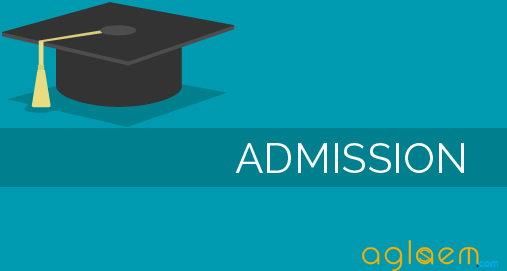 (Part-I)- A person who has passed one of the following examinations, with English as one of the subjects, is eligible for admission to 1st year of the B.A./B.Com. Any other examination recognized by Academic Council of the Maharshi Dayanand University, Rohtak as equivalent to (a) or (b) or (c) above. For B.A./B.Com (Part-II/Part-III)- The candidate shall be treated as promoted to the next class automatically unless detained from appearing in an examination on any genuine grounds. For M.A. 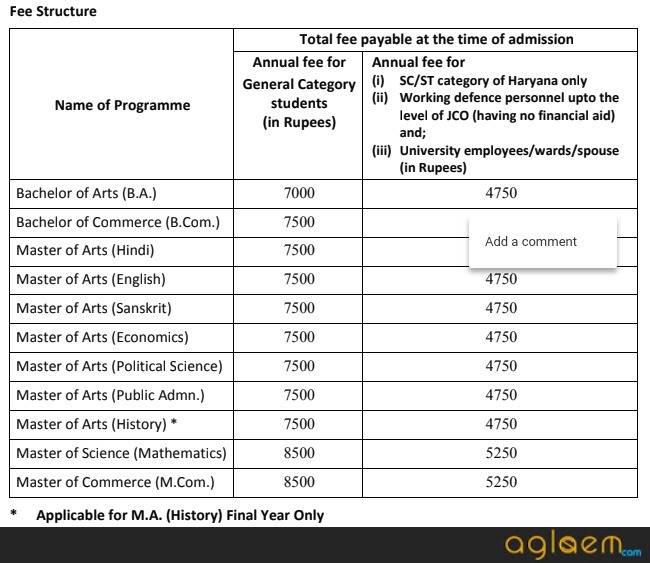 (English/ Hindi/ Sanskrit/ Economics/ History/ Political Science/ Public Administration) (Previous)- Bachelor’s degree/Shastri examination (New Scheme) of three-year duration or any other examination recognized by Maharshi Dayanand University, Rohtak as equivalent thereto. For M.Sc. (Mathematics)(Previous)- Bachelor’s degree of three year duration with Mathematics as one of the subjects in each year or any other examination recognized by Maharshi Dayanand University, Rohtak as equivalent thereto. For M.Com. (Previous)- B.Com. (Hons./Pass)/BBA/BA with Economics/Commerce/Marketing/Insurance as a subject or any other examination recognized by Maharshi Dayanand University, Rohtak as equivalent thereto. For M.A. (English/ Hindi/ Sanskrit/ Economics/ History/ Political Science/ Public Administration) (Final), M.Sc. (Mathematics) (Final)/M.Com (Final) – The candidate shall be treated as promoted to the next class automatically unless detained from appearing in an examination on any genuine grounds. Note: Candidates having compartment in the qualifying examination shall not be allowed admission to M.Com/M.A./M.Sc. Graduation Examination in one sitting after the passing Session 1998-99 shall not be allowed admission to M.Com/M.A./M.Sc. For Bachelor of Library and Information Science (B.L.I.Sc. )- Bachelor Degree from recognized University or its equivalent. For Master of Library and Information Science (M.L.I.Sc. )- B.L.I.Sc. from Maharshi Dayanand University or from any other recognized University or any degree recognized or equivalent thereof. The Directorate of Distance Education, consequent upon the admission of students to the courses offered by the University, through distance mode will validate the online submitted details and finally allot the Registration Number to each student, and the detailed record will be maintained for the registered students. 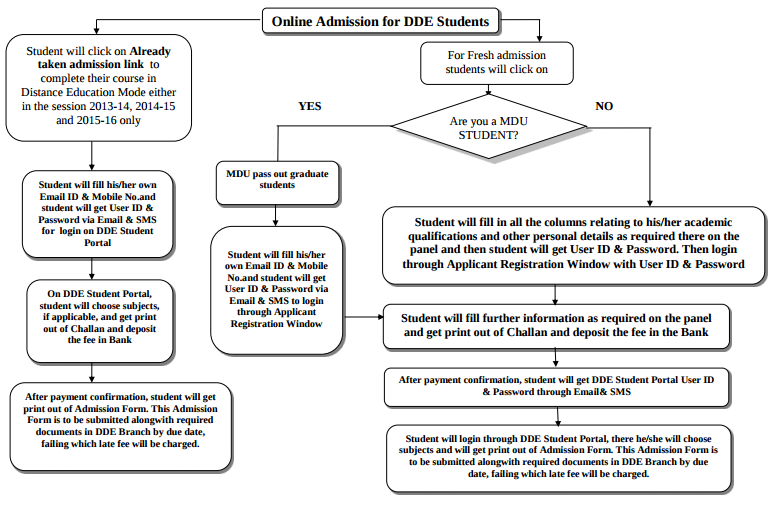 The student whenever makes any correspondence with the DDE is required to indicate his/her Registration Number. The candidates are advised to read information carefully before filling the Online Admission Form. Candidates seeking admission in MDU Distance Programmes can apply online in various discipline for this session from the link that will be provided below. A print copy of the Online Admission form along with requisite documents including proof of payment of fee, etc. 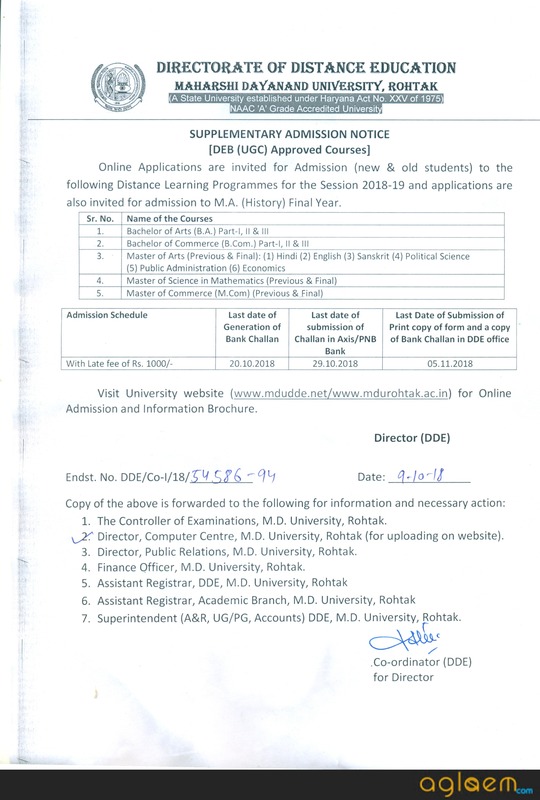 should be submitted to the Directorate of Distance Education, M. D. University Rohtak (Haryana) within the stated deadline schedule, failing which the application of the candidate for admission summarily may be rejected. Apply Online: Click here to apply online for the MDU Distance Education Admission 2018. Scanned images of photograph, signature and thumb impression should be in JPG/JPEG format. Size of the photo image should be upto 50 KB. Size of the signature should be upto 30 KB. Size of the thumb impression should be upto 50 KB. Note down your Username and Password for subsequent login. Fee can be paid through e-challan only at Axis Bank. Student should submit his/her Print Application Form alongwith required documents in the Directorate as per Admission Notification, failing which late fee will be charged or admission will be cancelled. Note: Snapshots for Online Admission are available below. The annual examination of Undergraduate and Postgraduate courses will tentatively commence during the months of April and May respectively. The examinations, however, can be extended under some compelling circumstances or administrative reasons. The exact dates shall, however, be notified by the Controller of Examinations. No request for adjustment in dates of the University Examinations to suit the convenience of any candidate will be entertained. Admit Cards/Roll Number slips for appearing in the University examination shall be provisional subject to the fulfilment of the eligibility conditions laid down in the Ordinance for distance education programmes of the University. The date-sheet(s) and Roll numbers/admit cards of all the eligible candidates will be uploaded on the DDE’s website, 10 days before the commencement of examinations which can be downloaded by the candidates. If any candidate does not find his/her Roll No./Admit Card on the website, he/she should contact the Directorate with three passport size photographs for issue of duplicate Roll No. Slip/admit card. No representation/request/correspondence relating to the issue of non-receipt or availability of Roll Nos./Admit cards by post or on the website after the theory papers examinations are over will be entertained and the candidate himself/herself shall be responsible for the consequences of not appearing in the examination. In such cases, the Directorate will not consider the requests of such candidates for refund/adjustment of fee paid by them or any claim for compensation or re-examination. The supplementary examinations of students having compartment/re-appear shall be held on the dates to be notified by the Controller of Examinations. All rules and regulations of the University shall be applicable to the students pursuing distance education programmes for matters not specifically covered above or in the regulations in question. The Students Support Services Camps are arranged for the benefit of students; hence they are advised to attend these. The study material of the concerned course will be supplied to the students from the Directorate of Distance Education and/or during the course of SSSCs. The study material will be provided only on production of Identity Card issued by the DDE or payment/fee deposit receipt etc. The students are advised to visit the website of the DDE [www.mdudde.net] and note down the venue and schedule of the SSSCs. According to the schedule notified, the students are advised to contact the concerned Course Coordinator and get themselves registered. Out-stationed students are advised to make their own arrangement for boarding and lodging. The students are required to bring their own note-books, pens, pencils, etc. Detailed programme/ time-table shall be made available at the SSSCs on the first day of the problem-solving session. Any change in the programme/venue/time of the SSSCs or problem-solving session will be notified on the DDE’s website. For any clarification regarding the concerned course/programme, the concerned Course Coordinator or local facilitator/Clerk may be consulted who will be available during the SSSCs. 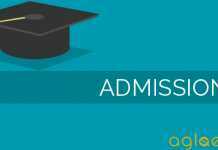 Could you tell me all information about Admission in B.A. Distance.? hey there the application form will be start soon. Sir b.a distanc s fess kitni h women ki ? m.a distance form open ho gye h kya ?? B.a distanc women ki fess kitni h plzz..? Maine bank challan to nikal Liya but fees pay nhi ker pai. Please help me ki M ab kaise challan pay ker sakti hu. Corse – M. Com second year. 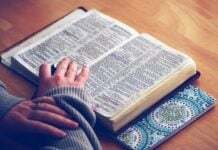 M.com k syllabus ki books to abni tk aayi nhi or exam bhi may be April me honge, to kb tk aayengi books ?